I love what I do but without the right tools, it would be difficult to get my work done. 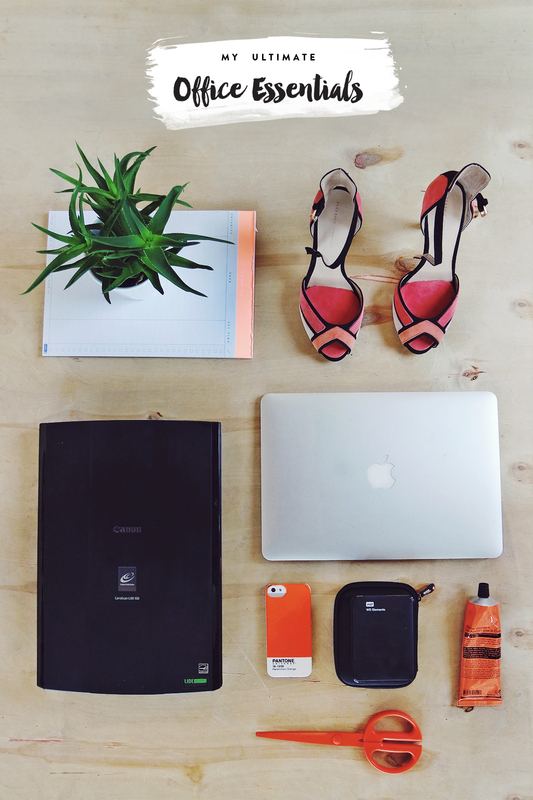 Every day that I’m in my office, I reach for these tried and true items to keep my projects running smoothly. I’m always on the hunt for products and services that have the right mix of looks, value and functionality and these are what I’ve personally found to work best. I love this camera so much. After going through a total of six others over the last 15 years, this is hands-down the best one I’ve ever owned. While I loved my Sony, this is leaps and bounds above in picture quality, durability and looks. The best part is that it’s WIFI compatible so when you’re on the go, you can snap a photo, send it straight to your phone, edit and upload on the spot. The quality of this puts phone cameras to shame so for the last year, I’ve been exclusively using it to shoot photos for my Instagram stream, not to mention every single photo on my blog. I could go on forever about this camera and its awesome features but the real proof is in how many people around me have the same exact model — Kat, Gala, Pam and even my mom swear by it! I used to have a big, clunky scanner until I was introduced to this model at one of my agency jobs. Besides being affordable, it’s super slim and the quality is fantastic. I’ve been using this for the last 5 years and it’s still going strong. Years ago, I had an ink jet but once I started doing larger scale projects, the cartridges just got to be too expensive. I knew laser printers were the way to go but had always assumed that the color versions were out of my league. After some research, I came across this Samsung model and it can print hundreds of color copies on the same set of cartridges. Plus, it’s so small that it fits right next to my desk. The days of those massive copy machines in offices are over — the quality of this is on-par with them! While the printer comes boxed with a starter set of color cartridges to get you going, I’d recommend bundling it with the separate full set of cartridges as well so you never run out mid-project. When you’re designing for long stretches, it’s nice to have quality basics nearby. I picked up this Aesop lotion on a whim and love its non-greasy texture and super citrusy scent. I’m a minimalist at heart and it’s one of just a few things I constantly keep on my desk. I still send projects to print all the time and as you know, what you see on your monitor is not always accurate. It’s also nice to have these on hand so you can list the PMS swatch equivalents in a client’s brand guidelines. This is the set I have and it comes boxed with both the coated and uncoated books so you’ve got the basics covered. When I needed an external hard drive a few years back, I started my search on Amazon and kept coming across rave reviews for Western Digital drives. They’re solid, a great value and both Mac and PC compatible. I now have multiples and recommend them to all my friends and clients. I always keep two on hand to run backups — one is plugged into my computer at all times to run Time Machine and the other is a complete backup of my computer I do every few months and store in a separate, safe place. As a sidenote, when I bought my first external hard drive, I threw it in my purse and was hard on it which led to the connecting cable going bad. Now, I’m much more careful and always carry it in a case. These cases are cheap, lightweight and fit the Western Digital drives perfectly. I renew my membership once a year and updates for the Adobe Suite download straight to my desktop. I use these products for a solid 10 hours a day and couldn’t do my job without them. If you’re curious about all the plan options, you can check them out here. My everyday workhorse, I’ve been on the same iMac for the last four years and it’s still going strong. When I finish a client’s suite of brand files, I send them a Dropbox download link to access them. It’s nice to have their assets stored in a place that they can grab as needed at any time. I have the Pro account and it’s more than paid for itself — I literally use it every day. I’m super careful when it comes to printing out comps of my clients’ works in progress, dealing with junk mail and any other documents I don’t want end up in the wrong hands. This shredder takes care of business, handling up to six sheets at a time. Yes, there are cheaper shredders but they jam constantly and there’s nothing more annoying than that. I’m super basic when it comes to tracking what needs to be done. There are a million apps and digital calendars out there but nothing has worked as well for me as good old fashioned pen and paper. I love these weekly planners because you can see exactly where you have gaps of time for meetings, projects and calls at a quick glance. When I’m busy, I don’t have time to sift through a million new albums. I love the endless amount of playlists on here, especially those by Tim Schlesser, who does the Ace Hotel mixes. I turn one on and it lasts all day, allowing me to star the best of the best songs to revisit later. I used to have the regular MacBook but after a series of 10 flights in less than a month, I was left with an aching back and knew that the Air was a necessity. I travel with this 13” model everywhere and even though it’s super thin and lightweight, it’s solid. More importantly, the battery life lasts and lasts. This medium size gives you room to sketch and explore and you can also pick up an optional mouse to use on the surface when you’re not drawing. I splurged when I moved into the new Branch studio last year and bought coordinating Poppin office supplies and not only are they fun but the quality is awesome. I reach for these ballpoint pens constantly. Okay, now it’s your turn! What products and services do you swear by to keep your creative business running smoothly? As a floral designer, my go to tools are my ARS red clippers (red handles are easier to find in a pile of greens), my stainless steel work table on wheels, my iPhone, my white Montblanc pen for taking notes and doing quick sketches for clients, colored pencils, a stash of flower buckets in the back of the car to pick up flowers from my local flower farmers and my two dogs who keep me company in the studio and help during wedding consultations. I looked at your site and your job looks like so much fun — of course, there’s always hard work behind the scenes but it looks like you get to really push your creativity at the same time. Hilarious! I have the same Aesop lotion – I love the citrus smell and it helps get me focused! This is such a helpful post! I’ve heard great things about the scanner—definitely eyeing it for my dream studio! I am also having a greater appreciation for Dropbox, as I’m using it more and more these days for work! And yes, can never go wrong with the Cloud. So important to have—it’s our life! Glad you found it helpful! And yeah, that scanner is a powerhouse. For being so thin and lightweight, I’m surprised it’s held up so well! I’m actually going to buy a new printer soon, so thank you so much for the recommendation! I use my Cannon Rebel as my main camera, but I could totally see the benefits of having something smaller. The space-agey grid fits in nicely with the rest of my minimal geometric decor, and my back feels totally fine even when I work long hours. Thanks for the super helpful post. I need my Moleskines, day planner and a good pen. My macbook pro is never far away and I always have loads of gum – as I tend to clunch my jaw when I get stressed! Haha! Also the new “Inbox”-app from Google is a life saver when it comes to all the mail. It sorts through all the mail automatically, so I only see one post for ads, and not 20. I have my office spot in the bedroom now, so I need to get the room organized – or I’ll get a huge head ache! Also I just bought a printer, which really helps me see my work with fresh eyes. I have been searching for a good laser printer- thank you for the recommendation! Do you know what’s the thickest paper it can print? Can it take 120b? Do you think it would be suitable for printing stationery? Thank you! Hmmm….honestly, I’m not sure. I’ve used photo paper in it and that worked just fine but haven’t tested out anything thicker. I’m sure the Amazon reviews would have some feedback on this, though! Thank you! I marked this printer and will do some research on it! P.S. Still remembering the Blogcademy weekend in NYC last year- it was so fun! Thanks again!! Awesome post. Thanks for sharing. Was in the market for a camera.,, was looking into Canon Rebel T4i but now, I just might have to simply get new lens for my T1 and then test drive the Samsung camera. The size definitely tips the scale for me. I used to have a larger DSLR, too but found that the weight held me back from carrying it everywhere. The Samsung is super small and light but with interchangeable lenses, it has a lot of the same features a larger DSLR would have. Great must haves! I couldn’t live without the Adobe Suite or my Macbook! My next upgrade will be an iMac for sure as well as getting the color swatches!